It’s not easy maintaining any sort of home; it gets even more difficult when you have to think about the needs of the other people in the house, some of whom are significantly smaller than you are. 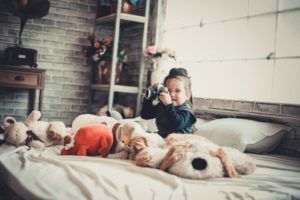 If you have children, then you’ve probably come to expect that your home is going to be something of a mess at all times, but it doesn’t have to be this way. Indeed, it’s more than possible to create a home that is both tidy and suitable for your child, too. Take a read below to see our useful tips. Your child will play anywhere and everywhere, given the opportunity. While this might be nice for them, it’s a nightmare for you, as you’re the one who’s always picking up the mess they’ve made. And after time, you might find yourself saying “stop playing” to your kid, just because you don’t want to clean up after them! As such, why not consider setting up a games room in the house? This will be a space that’s specially reserved for fun and playing, so you can let your kids play until they’re tired out safe in the knowledge that all the mess is contained. A child’s home can be functional, but it should also be fun! After all, which youngster wants to spend the nights in an uninspiring, boring bedroom? None! To liven things up, look at getting a unique bed from Cuckooland. You can select a teepee bed, treehouse bunk bed, or a London red bus bed – any of these are sure to make your child more excited for bedtime. You should also look at making the walls as bright and colorful as possible; nothing inspires the mind – and play time – like being surrounded by funky, art inspired walls. You’ll feel much saner – and your children will be safer, and better to enjoy their playtime – if you have ample storage space for your child’s toys. Look at adding smart storage options around your home, and you – nor they – will have to stand on a forgotten lego piece again. In the autumn and winter, your child will happily spend long evenings curled up on the couch with you, watching film after film. But in spring and summer? They’ll want to be in the outdoors, just like everybody is! But the question is, how child-friendly is your garden? If it’s looking a bit uninspired at the moment, then get to work on upping the fun levels. It’s not too complicated to have a swing set on your property; you can buy one, or even make it yourself. And for the really hot days, you can’t look past a small paddling pool to really bring joy to your child’s face. Children want to learn! Add a cozy reading nook, or install a big map of the world, and they’ll be able to learn on their own time. Every parent’s dream!